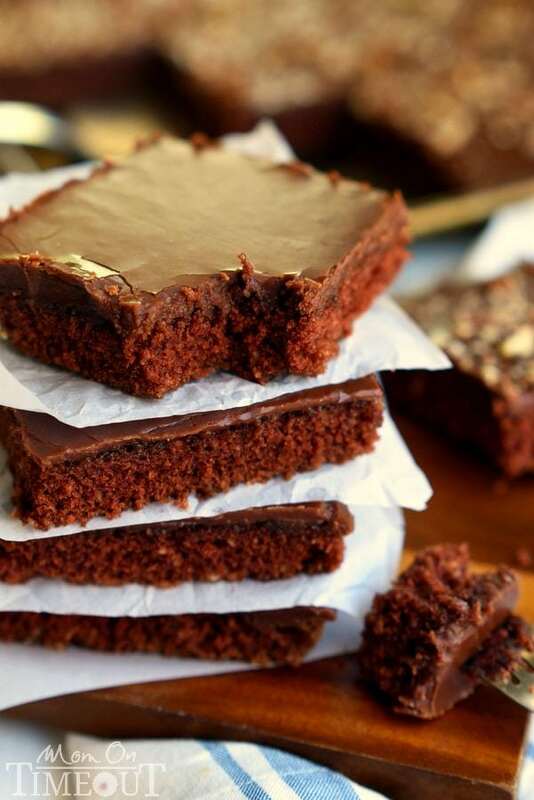 The legendary Texas Sheet Cake is my go-to cake recipe to feed a crowd! Easy as can be, this cake boasts intense chocolate flavor and richness and can be made with or without nuts – dig in! Craving chocolate? Make sure to try this Triple Threat Chocolate Cheesecake, Cheesecake Brownies or my Chocolate Zucchini Cake for the ultimate chocolate treat! Dilemma. You have a crowd coming over and you want to make a cake. Chocolate cake. But you don’t want to have to break out your cake pans, make layers, smooth on frosting, etc. You want something quick. But from scratch. What do you do? 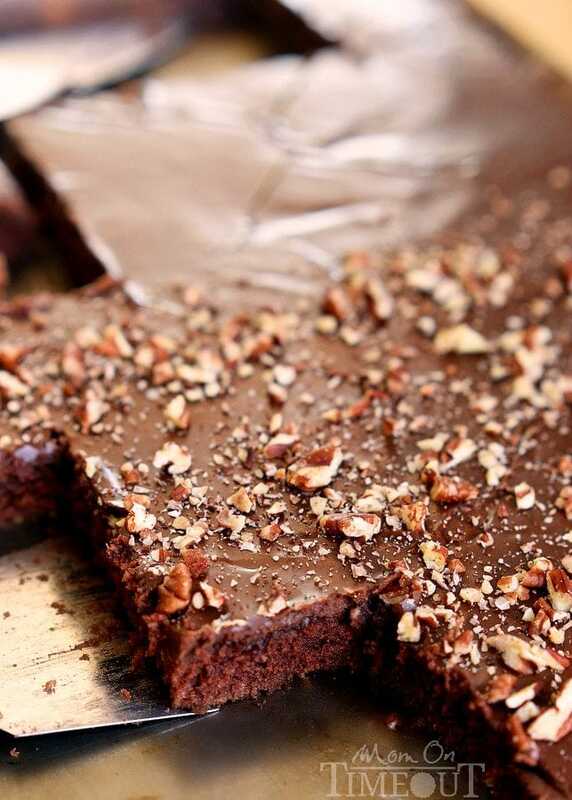 Make a Texas Sheet Cake. Duh. This cake is the reason jelly roll pans exist. Honest. I can’t think of a single better way to use mine. When I make a cake it’s usually a big ordeal. Trying to pour the same amount of batter into each cake pan is a struggle. Then you have to get them out of the pan in one piece, then you have to frost and decorate and then cross your fingers that when you go to slice it, the slices come out pretty. If all of that ^^^made you cringe, this is the cake for you. Maybe you need to serve more than a dozen people and you don’t want to have to sit there and cut slices of cake, this is the cake for you. Furthermore, if you like chocolate, chocolate, and a little more chocolate, this is the cake for you. Do Texas Sheet Cakes Have Nuts? First of all, for those of who us who grew up on sheet cakes like this, there comes a time when the “great nut debate” takes place. Some like it with, some like it without. 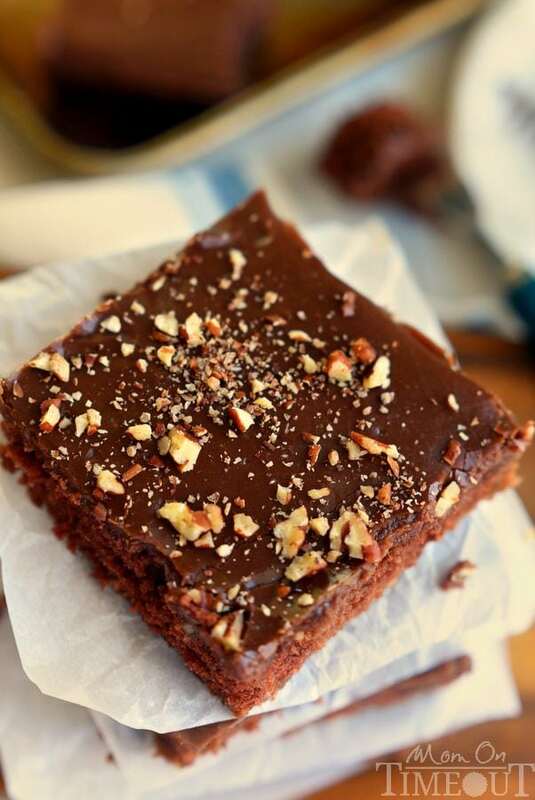 Often times, the nuts are stirred into the frosting and so the entire cake is coated with nutty frosting. A good thing if you like nuts. Something terrible if you don’t. Because there is always some debate, after frosting the cake, I sprinkle nuts on half (quickly because this frosting sets up FAST) and leave the other half plain. That way, people can serve themselves from one side or the other and peace has been restored once again. Speaking of serving, let the people do it themselves! Who are we to say how big a piece of cake each person gets? No! Not good, not good at all. I say let your guests serve themselves…it’s for their own good and your sanity. Trust me. I make my Texas Sheet Cake with sour cream. Always have. I see a lot of recipes that call for buttermilk and to be honest, this is because they are serving the same purpose in this recipe. 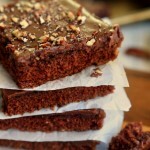 They both add a lot of moisture and a bit of tanginess that compliments the chocolate overload that is taking place. I think the sour cream provides an even better texture so that’s why I include it in my recipe here. This cake recipe is so awesome because it calls for pantry staples meaning you can whip up one of these babies any.time.you.want. Can we take a moment of silence to admire that frosting? I just want to lick it. Don’t judge. It’s crazy good and my most favorite chocolate frosting on the planet. The chocolate frosting is actually more of a glaze and it gets poured – yes, I said poured – over the cake while still warm. 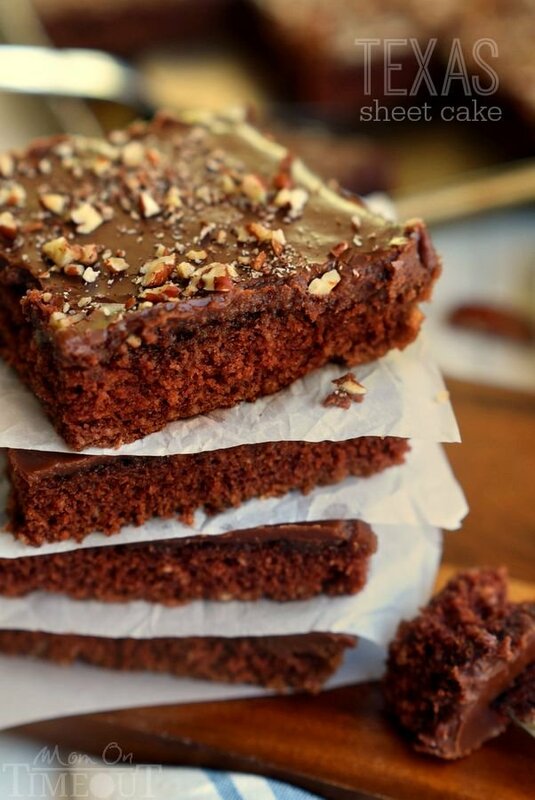 This means it kind of soaks into the top layer of the cake creating irresisitble layers of chocolate goodness. If you’re like me and enjoy a good Texas Sheet Cake now and again, welcome home. 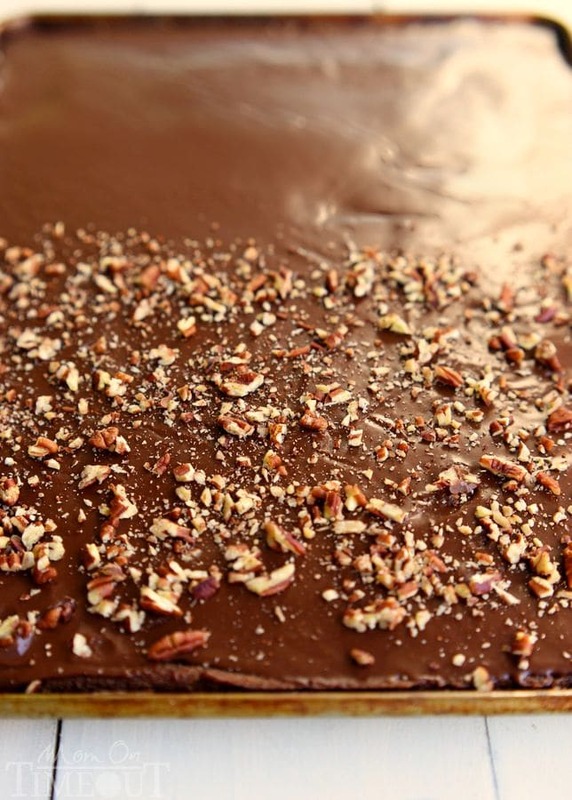 The legendary Texas Sheet Cake is my go-to cake recipe to feed a crowd! Easy as can be, this cake boasts intense chocolate flavor and richness and can be made with or without nuts - dig in! Bring butter, water, and cocoa powder to a boil in a medium saucepan, stirring frequently. Remove from heat and let cool for 10 minutes. Pour the batter into the prepared jellyroll pan. Bake for 22-25 minutes. The center of the cake should spring back when touched. Bring the milk and butter to a boil. Remove from heat. Whisk in the powdered sugar, cocoa powder, salt and vanilla extract. Leftovers should be stored in airtight container. Wow!! Very Awesome cake recipe.just I read your recipe and after I will make this great recipe. That frosting looks incredible! Definitely need to keep this cake in mind for our next gathering! It’s the BEST Jessica – thank you! How can I pick with or without nuts when they’re both SO good? And it’s so much easier than layering and frosting and stacking and all that. And just as tasty! I’m jealous of your friend Amy for getting to try it! Trish, we ate our squares so fast, I don’t think we even tasted them. Might need to bring over some more. You know, for further testing.